It’s recently been announced that Meghan Markle, The Duchess of Sussex, is expecting a little one! However, her skin is too radiant for pregnancy hormones to be the ~only~ factor that’s giving her such a spectacular glow! Get ready, because we are about to share with you all of her tricks, so you can achieve her glowing and perfect skin! Megan Markle avoids gluten in her diet to maintain her healthy skin. In an interview with Delish she shared how much better her skin looked on the screen during her acting days after she did not eat gluten. However, saying goodbye to gluten isn't her only trick. She also explained that almonds are one of her go to snacks, since they are packed with Vitamin E and plant proteins! Meghan Markle has a strict skincare routine that she follows and it clearly pays off! The Duchess revealed her secret weapon in an interview: her exfoliator. A gentle exfoliation is a must for removing dead skin cells that block brightness. “I really love the Tatcha Rice Enzyme Powder. It just sort of foams on your face and gives you a really subtle exfoliation,” she said. Incorporating exfoliation to your skincare routine will give your face amazing results. Dry skin is not a good look; it shows discoloration, redness, and flakey irritation. Hydrated skin gives you a healthy and clean glow! Meghan Markle shared that her favorite moisturizer is the Kate Somerville Quench Hydrating Face Serum. The Duchess also uses the Nivea Skin Firming Body Lotion to hydrate the rest of her body. As winter rolls around and the air grows more brisk, moisturizer is a necessity to fight dry skin! The Duchess doesn’t just use any old makeup! Certain makeup can be made with chemicals that are harmful to your skin. It can also block your pores and appear very thick on your skin. Meghan revealed to Today, “I don’t wear foundation unless I’m filming, so this [the Laura Mercier Radiance Foundation Primer] is what I put on every day after moisturizer to give my skin a dewy glow.” This primer will give you a flawless, airbrushed look in no time! Make sure to use it sparingly to avoid a cakey look. Meghan Markle’s skin would not be complete without her highlight. Highlight is a signature feature of her perfect skin. 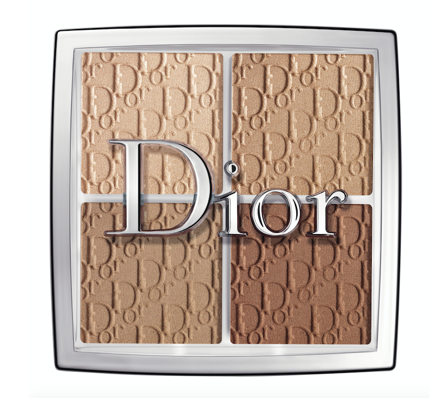 According to Elle, Meghan’s makeup artist, Daniel Martin, uses the Dior Backstage Contour Palette. To get your highlight looking natural from the comfort of your own home, you should lightly dust the powder with your brush onto the top of your cheeks, and move your brush up toward the temple. ~Highlighting Hack~: If you don’t own a highlighter, have no fear; it is still possible to have glowing skin! Daniel Martin revealed that instead of using a highlighter, you can put on a bit of Eucerin’s Aquaphor Soothing Skin Balm. This product doesn't clog your pores, and will still give you the same shine that a highlighter would.